Food delivery services like Uber Eats and Grubhub are taking off like a rocket. But some restaurants aren’t on board. This week, Jimmy John’s sandwich chain launched a national ad campaign promising never to use third-party delivery. 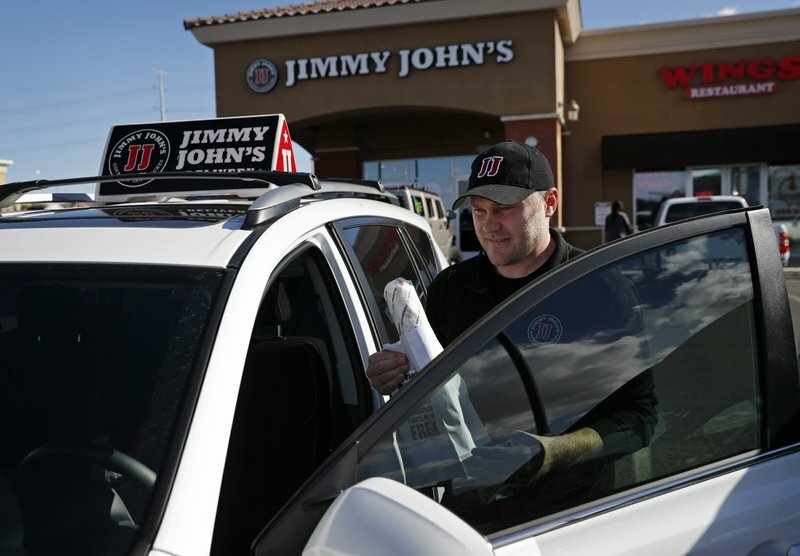 Jimmy John’s says its own drivers — which number around 45,000 at its 2,800 U.S. restaurants — can best ensure fast, quality service. “We just don’t trust anybody else to deliver our product,” Jimmy John’s President and CEO James North told The Associated Press. Jimmy John’s is swimming against the tide — for now, at least. Starbucks recently announced it’s expanding delivery to more U.S. stores through its partnership with Uber Eats. Taco Bell said Thursday it will offer delivery nationwide through Grubhub. Others besides Jimmy John’s have rejected third-party delivery, including Domino’s, Panera Bread and Olive Garden. In some cases, it would disrupt their long-established business models; Domino’s has been delivering pizzas for 60 years. Other companies just aren’t convinced. Olive Garden tested third-party delivery but says its customers weren’t satisfied. There’s a lot for restaurants not to like. Delivery services eat into their profits. Grubhub charges them a commission of 12 to 18 percent per order; Uber Eats charges as much as 30 percent. Service can be haphazard; some drivers have coolers to keep food chilled, for example, while others don’t. Third parties can also take longer. Boston Consulting Group found that four of the most popular services — Uber Eats, Grubhub, Postmates and DoorDash — averaged 49 minutes to deliver an order. Liz Meyerdirk, Uber Eats’ head of global business development, says Uber Eats averages 31 minutes. Jimmy John’s average is less than 20 minutes, partly because it limits delivery to a small radius. The company trains its drivers and gives them uniforms, North said. Pay varies by location. Jimmy John’s charges customers around $2 for deliveries — some third parties charge $8 or more — and makes that work economically by doing more deliveries per hour. “With Uber Eats, the drivers have no vested interest in getting the customer their food quickly,” North said. Robbins has also had occasional issues as a customer, like waiting so long for sushi that it arrived warm. But he’ll continue to use delivery services because it’s the most convenient way to eat between classes. “We’re all trying to figure out how to serve that customer,” she said. Farm Burger, an Atlanta-based grassfed burger chain with 12 locations, has limited marketing resources, so it’s grateful for the business that delivery services bring in. After DoorDash featured the chain in a December promotion, it saw an all-time monthly high of 2,942 orders, says Dawn Law, the chain’s marketing director. Even McDonald’s says 70 percent of the orders it gets through its partnership with Uber Eats are customers it might not have gotten otherwise, particularly late at night. At the same time, he said, many big restaurant brands will probably follow Jimmy John’s lead and do their own delivery so they can control the customer experience and retain valuable order data. “They may use third parties today because they want the demand, but in the long run they don’t want to be dependent on them,” Bolden said.